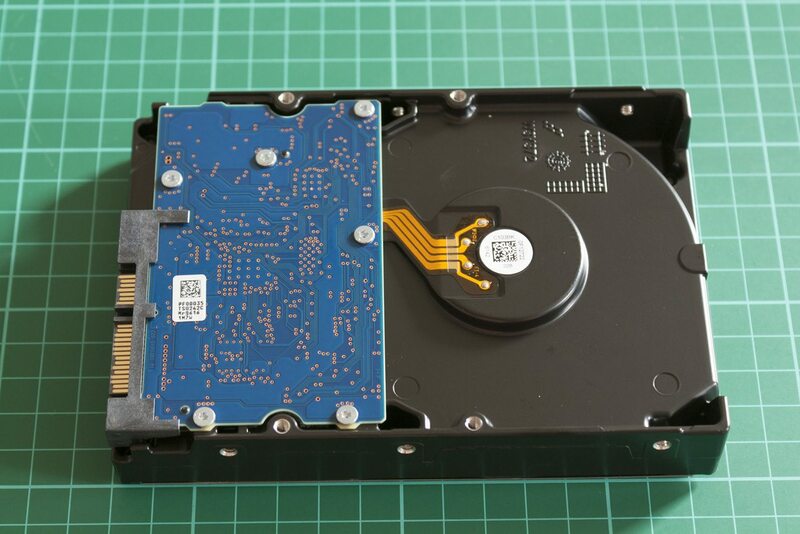 Looking for a hard drive to store your legal downloads? This 3 TB drive from Toshiba is the top result on Amazon right now, making it a promising candidate for anyone looking to solve their disk space woes once and for all — at least for a couple of years, anyway! 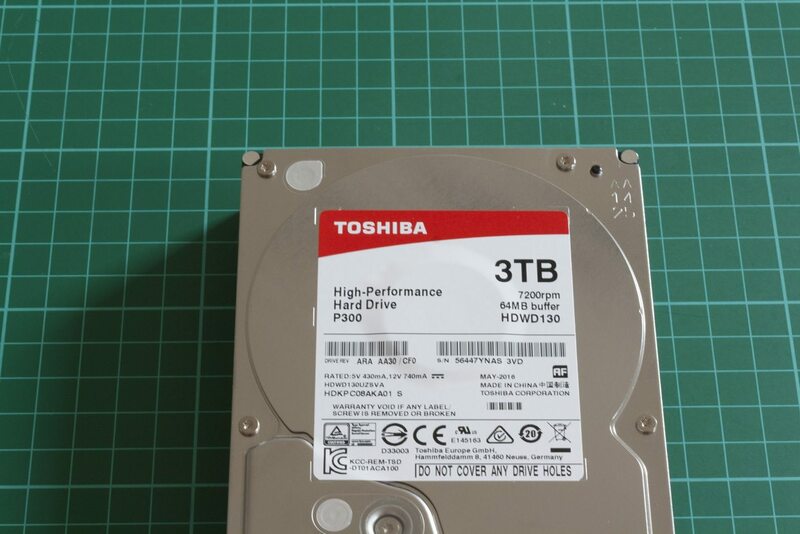 Let’s see if it’s earned that top Amazon place — here’s our review of the Toshiba P300 3TB hard drive! We’ll be comparing the P300 against our previous contenders, including internal and external drives, to see how it stacks up against the competition. We’ll be testing the drive in our XSR test rig, which has a Core i5 6600K processor, 16GB of Crucial DDR4 RAM and runs Windows 10. The P300 performs as expected in the test, providing reasonably fast read and write speeds for sequential data (e.g. large files) of about 150 MB/s. 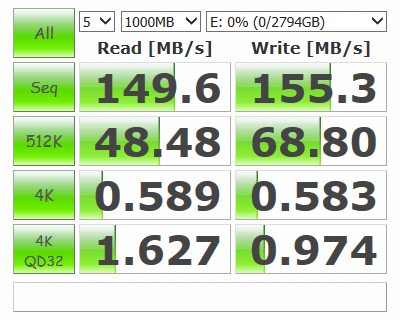 That’s about three times slower than most of the SSDs we’ve tested, which is not bad at all for a mechanical disk. In fact, it’s the fastest mechanical drive we’ve tested recently. We got a repeated error message when trying to measure the read access time, so that measurement has been omitted. 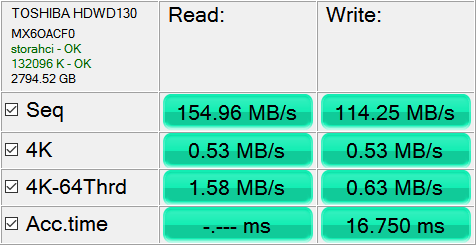 In any case, the sequential read and write speeds are impressive, and are in keeping with our other results. The Atto test gives a better idea of how performance changes across a range of data sizes. 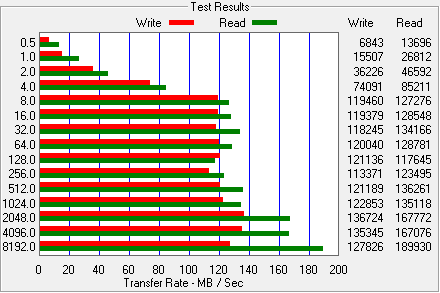 Read and writes speeds were largely between three and four times as slow as our test SSDs at larger sizes (e.g. 1MB and above), but results at 32KB were also pretty reasonable — 118 MB/s writing and 134 MB/s reading. Curiously, performance dipped after 32KB, and didn’t reach these levels again until the 512KB size test — weird. Still, it’s an encouraging result for a 7200 RPM drive, and perhaps speaks to the laundry list of features Toshiba included. 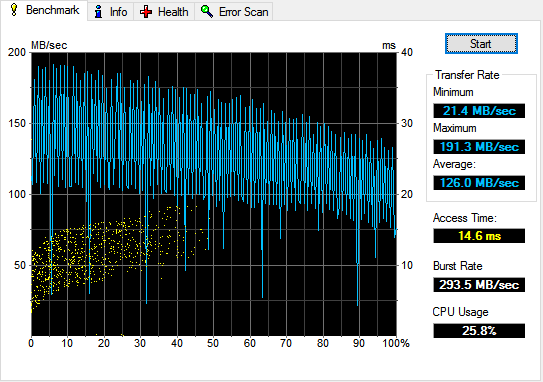 The P300 displays a lot of variance in its transfer rates, as you can see by the zig-zagging line above. Even compared to past HDDs, it’s quite different. However, the 294 MB/s burst rate and 126 MB/s average transfer rate is commendable, on the upper end of what we’d expect from a modern HDD. Access times are also slightly lower than expected, coming in just under 15 ms. The Toshiba P300 is an excellent modern hard drive that boasts strong performance at a very reasonable price. With recent price drops pushing the P300’s price south of $80 (£65), the drive has become even better value.